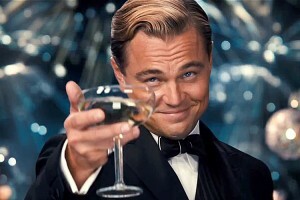 “The Great Gatsby” directed by Baz Luhrmann still delights cinema lovers. This story about a rich, romantic and sometimes desperate Jay Gatsby was written in the twenties by F. Scott Fitzgerald. Now, director Baz Luhrmann moved the novel to screens and gave it a peculiar expression. The film tells incredible story through Nick Carraway‘s lips. His memories return in the twenties when Nick comes to New York and settles in rich man’s Jay Gatsby neighborhood. When neighbors meet Nick finds himself in a world of wealth, love and despair. Talking of it, neighbors meet not by accident – before the war Gatsby loved Nick’s cousin Daisy. In those days the love of young people ended unhappily. Gatsby was just an ordinary young man, so beautiful Daisy married to rich and noble Tom Buchanan. Now Jay Gatsby is rich and has illusion to repeat the past and retrieve Daisy. At the beginning Gatsby is surrounded by many uncertainties – the rich man never appears in luxury parties at his house, it is unclear how he enriched; moreover, Gatsby’s desire to meet with Nick looks mysterious. These intrigues are maintained throughout the movie; new circumstances don’t allow the viewer to get bored. Also the group of famous and talented actors attracts attention. Leonardo DiCaprio leaves no doubt that Jay Gatsby is charming, self-confident, but at the same time vulnerable and even cruel man. A little bit dimmer looks his colleague Carrey Mulligan. She appears weak and lost instead of the soft and charming woman. One the one hand, the audience could miss the authenticity of music track. On the other hand, the atmosphere of the twenties complemented by modern Lana Del Ray, will.i.am and Jay-Z beats seems an interesting attempt to combine classics with modernity. The most “Great Gatsby” stands out with its visuality. Luxury images of the characters are matched to the details – houses, parties, clothes, cars – and looks like real fiesta. Many critics consider that visual aspect makes this film superficial. But it is clear that by using superlatives director wants to say that behind shining treasures vanity of soul, simple human desires, or unused opportunities lay hidden. It was expected much from “Great Gatsby”, therefore it has received a lot of ambiguous reviews. Some say that director didn’t reveal details of F. Scott Fitzgerald novel; others say that earlier versions of the film were more mature in content, not covered with glamorous gloss. However, it is difficult to compare these things when we talk about different each director’s interpretation. So this time story of love, illusions, and tragedy is shown through the prism of Baz Luhrmann. This version causes emotions and makes an impression, so the “Great Gatsby” can be called great and luxurious not only as the hero, but also as the movie.